I’m back. Sorry for the long period between posts but it has been a tough month or so in the world of Diva Crows. The first blow was the unexpected death of Gwen and Stephen’s chick Magellan a week after he went off to be crow-in-residence to first-time crow servants Hilary and Jonas. He began his reign by taking the name Quentin. He quickly won over all the denizens of his kingdom, including a huskie, four rats, and six or seven hedgehogs. He was amenable, charming, and won everyone’s heart. But it turned out that Quentin’s purpose was not to have a long and prosperous reign but to leave a bittersweet legacy of lessons learned and dreams of what might have been. Super Servant Hilary found Quentin limp on the bottom of his crate in the morning. He died a few hours later, before he could get to a vet. The cause of death is not entirely clear but the necropsy suggested inhalation of toxic fumes. Which brings us to the evils of deceptive labeling. Quentin left the inevitable droppings which were cleaned up with a “pet safe” carpet cleaner. It turns out two of the five ingredients in the stuff aren’t great for anyone but are toxic to birds. Please check your household cleaners and dump anything that claims it’s safe for pets, especially if there is a photo of a cute puppy or kitten on the label. By “pets,” the manufacturer means “mammals.” Misleading? You betcha. Quentin paid the price for some sleazy advertising. The moral of the story: if you have birds, use Poop-Off. If you must use another cleaner, double-check that it is safe for birds. Given the tragedy of Magellan, the only solution was to send Marco Polo home with Hilary and Jonas. No one can replace Quentin but MP has his own charms. 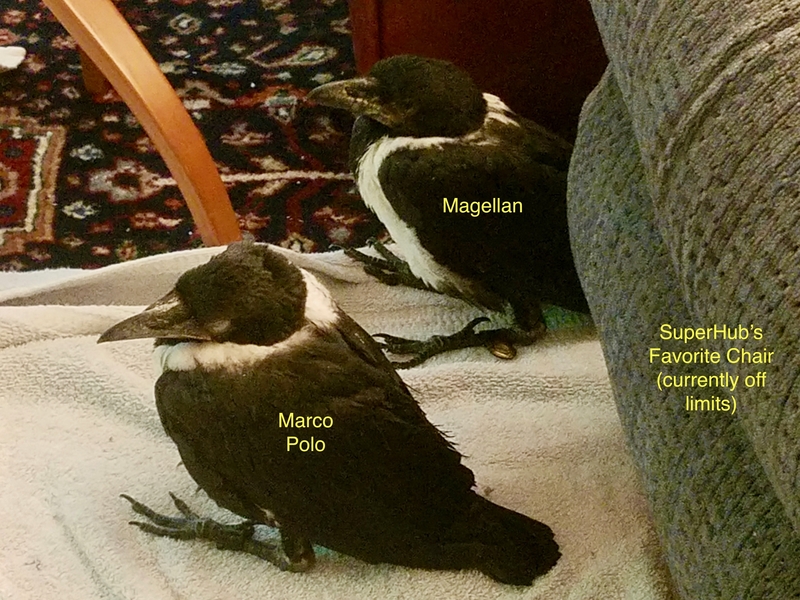 It turns out that one of them is being female, so Marco Polo has become Amelia Earhart because she loves to fly but is not great at landings. AE picked up where Magellan left off and is having a great time running the household. And thus we have a reasonably happy ending. Once chick season is over, things usually calm down but not this year. 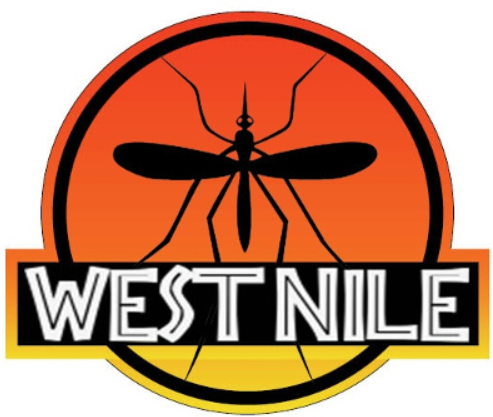 We are experiencing a vicious outbreak of West Nile Virus. Last year I had six WNV cases and two survivors. This year it’s been well over 20 birds, including those who have died before they could get here. The disease is cruel. The bird loses its ability to fly, then walk, and finally to stand. Some have experienced brutal seizures at the end stages of the disease. I managed to keep two alive for a couple of weeks before they suffered relapses and died in spite of all my efforts. I have one single bird that I thought was ready to go but today’s release attempt failed. He just trembled at the bottom of the box, so back he went with me. West Nile is transmitted primarily by mosquitoes. 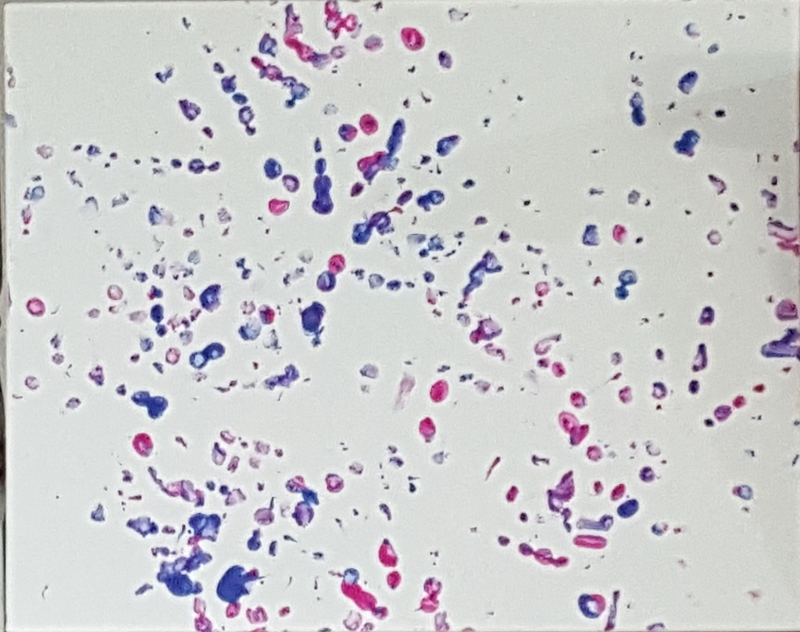 People can get it from insect bites but not from infected birds — or at least you really have to try. Birds can transmit the virus through saliva, so kissing a wild crow is definitely not recommended. Droppings are also a vector but presumably not something people generally handle. That’s it. So no panic please. Save your energy for feeling sorry for all the birds out there who have succumbed to this horrible disease. In short, it’s been a bleak rehab season. 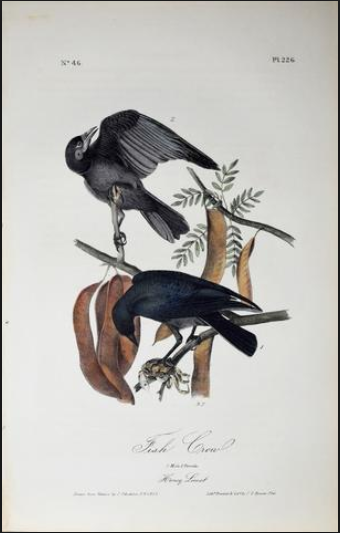 Since bird to bird infection is possible, I’ve taken in fewer tweety birds and concentrated on the crows. Many WNV crows means few releases. Today, however was a bit different. I’ve had a juvenile fish crow for about a month. 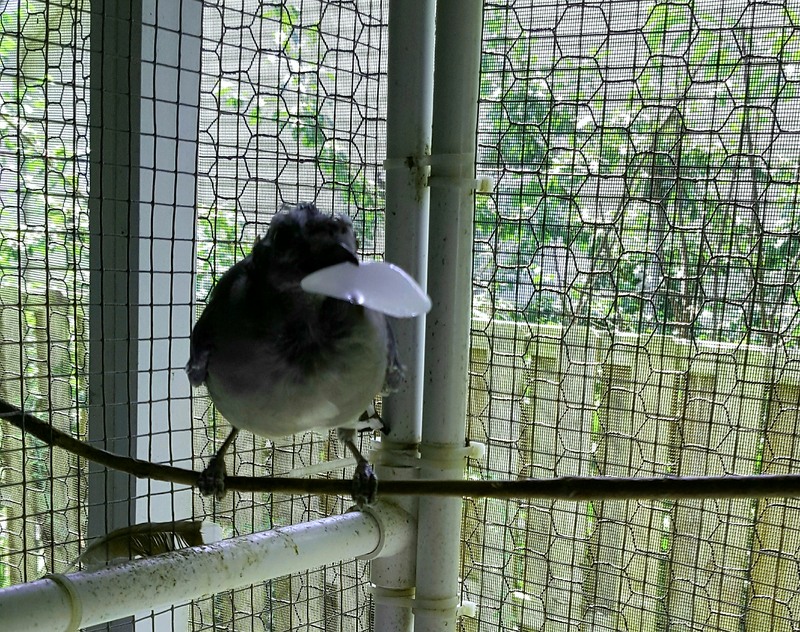 It turns out that fish crows have a higher resistance to WNV than American crows (the standard issue ones), so I managed to get this guy back into shape and released him where he was found. He blasted out of the box so quickly, I couldn’t get any pictures and flew off into the trees. Within 30 seconds, there was raucous cawing going on everywhere, although I never saw a single bird. I now know what “Where have you been?” “Look, who’s back!” and “Were you abducted by aliens?” sound like in Fish Crow. So yes, all those scientists are right. Crows do have a highly developed family structure and sense of community. So what else is there to report? My computer died (another reason for no blogging), Gwen and Stephen have made good progress on molting, as has Snafu, who decided to be bald as an egg for a couple of days. Zen is also fine. Both birds have been hitting the summer camp circuit, doing programs and grossing out kids by eating pinkie mice. It’s a nice gig if you’re in to that sort of thing. Super Son returns to college next week and just like that the summer is more or less over. With everything that has happened, I can’t say I’m heartbroken. But it’s not all doom and gloom. About a week ago, I went to Richmond to visit Ginny the Wonder Crow at Maymont. 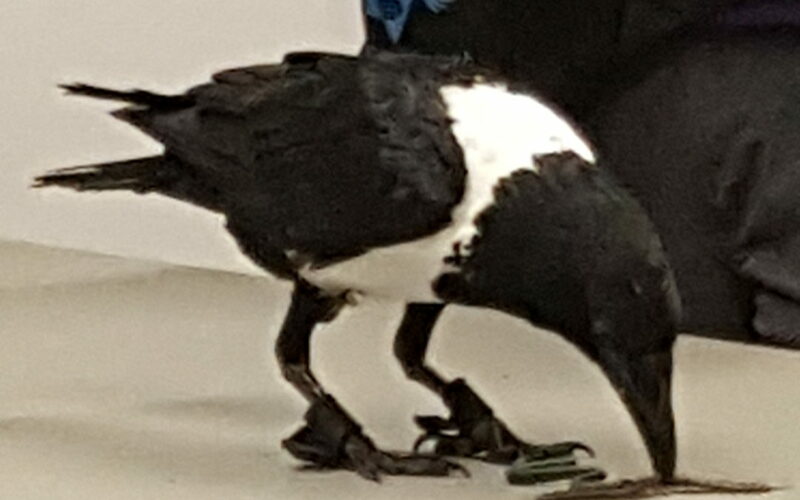 Ginny, whom long-time readers will remember as a 2017 chick, is now doing a full program, playing catch with audience members, pulling a bucket up to a perch to get a treat, demonstrating different eating techniques (pecking vs picking up), and showing she can differentiate the color purple. But that was just the beginning. Ginny is an artist! I now have an original Ginny painting. Note to Sotherby’s: Dream on, losers. You’ll never get your hands on this masterpiece.